There may never be a Facebook phone, but the social network is apparently developing a Phone application. 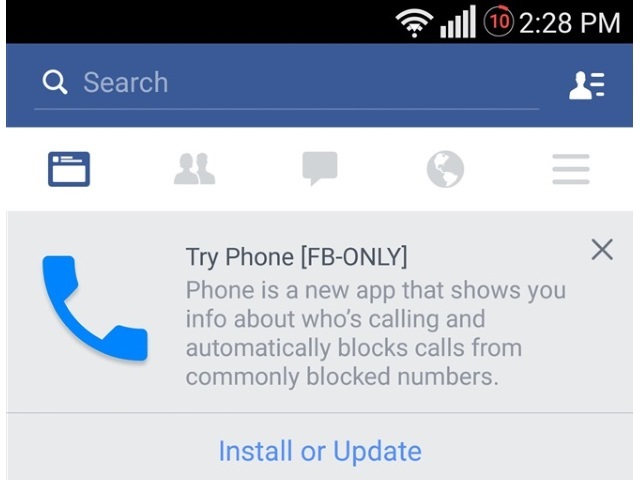 Android Police reported that an app called Phone was discovered by some Facebook users. The app’s entry was labeled “FB-ONLY,” likely meaning it was only intended for use by employees of the social network, and users attempting to install it are unsuccessful, encountering “no page found” errors, which Android Police believes is due to the app being stored on Facebook’s internal servers. The main purpose of the Phone app seems to be enabling users to see more information about callers before answering, as well as to block numbers that are commonly blocked. VentureBeat also speculated that Phone is an auto-dialer that enables users to access the phone numbers associated with their Facebook friends’ profiles, adding that some Facebook users who are not employees of the company have been prompted to install the app. We are always testing things and have nothing to announce at this time. Readers: Would you try out a Phone app from Facebook?